B-Format signals from the Soundfield mic can now be decoded directly within Pro Tools thanks to Soundfield's plug-in. More and more post-production work is ending up in surround-compatible formats such as DVD. We explain how to set up your Pro Tools system to do that work, and give some guidelines on recording and mixing in surround. In this month's Pro Tools workshop we are going to concentrate on recording and mixing audio in surround for music, broadcast and film. Be aware that to get the best results working in surround you will need a TDM system, but there are ways to work in surround on LE systems (see separate box). 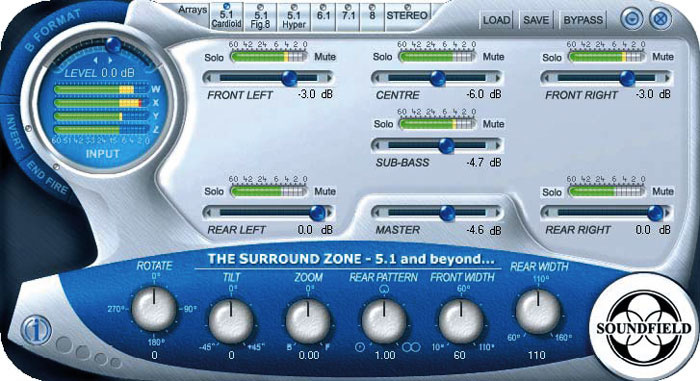 If you haven't done so already you might like to refer to the excellent series of articles called 'You Are Surrounded' published in Sound On Sound from August 2001 to April 2002, which is an excellent guide to all the theory and systems in use in surround production. When recording material, whether it be for radio, film, TV or music, you will get a much better, more believable finished product if you consider how best to record it for surround. You will also find that the stereo version won't be compromised, and you may even be pleasantly surprised to find that it has more 'space' in it. Waves' M360 Manager helps the process of calibrating a surround monitor setup.In essence, you will want to capture the normal sound as you have always done, but also to capture more ambience or room sounds to enable you to place the listener in a 3D soundfield. In order to do this you must first 'listen to your room'. With conventional stereo recordings, we can choose mic placements that can reject some of the room sound, but in a surround recording that room sound is an integral part of the overall sound. This makes the quality of the acoustics of the room very important, and may mean you have to choose a more expensive studio to record in — one that has a good room sound because they spent the money on a good room design! To illustrate this, let's look at recording a drum kit as an example. Normally you would have a conventional mic setup of kick, snare, hi-hat, toms and overhead mics. For a surround recording, you might add to that four 'surround' mics, spaced perhaps four feet in front of and behind the drum kit and around six feet apart. These extra mics can then be routed to the left, right, left surround and right surround channels and mixed to suit, so enabling you to place the listener in with the performers — or, by using more of the 'rear' mics, to place the listener in the 'front row'. As you track other instruments you can build on this concept: for an electric guitar, for example, as well as using the traditional SM57 on the cabinet, you could try recording a 'space' mic six feet back into the room, maybe quite high up, to use in surround channels. Obviously, if the recording space doesn't lend itself to adding loads of ambient mics — maybe because the background noise level is too high — then you can use a good reverb plug-in instead. Surround reverbs will do better than stereo ones in this context, but even so, it is more difficult to replace a 'real' space than in a stereo recording. Other approaches to surround recording include the so-called M-S-M array. If you use an M&S pair (a combination of cardioid and figure-of-eight mics with an MS decoder to produce a stereo output) in your recording, simply adding another cardioid mic pointing in the opposite direction to the forward-facing cardioid mic will give you a surround-capable array. The front output is produced as normal and the rear output uses the new rear-facing cardioid and the same figure-of-eight as the front for the surround channels. 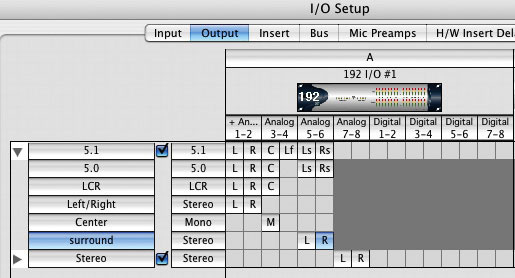 A typical 5.1 arrangement in the I/O Setup window, with sub-paths for LCR, Left/Right, Centre and surround outputs, and separate stereo monitor outputs.Another alternative is the Soundfield system, which enables you to record in surround with one microphone. The Soundfield mic processor can produce four outputs in what is called the B-Format, where the 'W' source is an equivalent to an omni mic, 'X' represents the front-to-back information or depth, 'Y' represents the left-to-right information or width, and 'Z' represents the up-and-down information or height. If you record these four outputs, it is possible at the mixing stage to recreate the illusion of a mic 'looking' in any direction using the Soundfield processor. Add this to the Soundfield Pro Tools plug-in, and from the B-Format signals you can produce a 5.1 recording that you can 'steer' in post-production. With all these techniques, experimentation and your creativity are key. Don't be limited by the rules, but do check and listen carefully to what you do to make sure it works in mono, stereo and surround. Whether you are remixing a stereo session or starting a new surround mix, you will need to change your Pro Tools I/O Setup for surround. 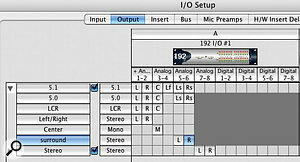 Select I/O from the Setups menu and choose the Output Tab. Create a new path and select 5.1. You will also need to set the order of the surround outputs. To do this, click on the '5.1 Default Path Order' drop-down menu in the bottom left-hand corner of the I/O Setup window and select the one that suits the way you have your monitors connected to your interface. I use the SMPTE/ITU option, as it means outputs 1&2 are still connected to my front left and right monitors. You can also select sub-paths, which will enable you to route audio just to specific outputs like the Centre or Surround channels. To do this, select the main path, in this case '5.1' and then click on the New Sub-path button. You can then create a range of sub-paths to suit your project. Digidesign's surround-compatible Revibe reverb.To monitor in 5.1 surround you are going to need five main speakers as well as a subwoofer. Ideally, the five main speakers should all be the same brand and model, and certainly from the same 'family'; it is quite acceptable for the surround speakers to be a smaller speaker from the same range, but it is generally accepted that the front three should be the same. In professional settings, the Sub is only for Low-frequency Effects (LFE). Your main speakers should be 'full range' and not depend on the sub for low-frequency reproduction. In the real world, however, this isn't always possible, so you will need to use the sub as a subwoofer as well as for the LFE channel. In this case it is very important that your system is set up correctly so that it is as flat as possible, otherwise your mixes will not transfer to other places correctly. You also need to calibrate your speakers so that the sound level at the mix position is the same for every speaker. This should be done with pink noise, and you will need some form of sound-level meter to measure the volume. Set the sound-level meter on a stand at the place where your head would be when sat at your preferred mix position. Then route pink noise to the left front speaker and adjust the level of the pink noise to an easily read amount, say 80dB SPL. Then mute the feed to that speaker and route the pink noise to each of the speakers in turn, adjusting the level going to that speaker until the sound-level meter reads 80dB SPL. If you have the Waves 360 Bundle, it makes this calibration process a lot easier, as one of the elements of the 360 Bundle, M360 Manager, enables you to easily solo each feed and to fine-tune all the levels. Remember to save the settings for future use! This subject is so enormous I could easily fill this entire issue, and more, working through the subject. If you want detailed information, advice and practical support, I recommend Rich Tozzoli's Pro Tools Surround Sound Mixing (Backbeat Books, ISBN 087930832X). To get you going, though, here a few ideas. Mix in 5.1 or 5.0. Even if you are mixing a Dolby Pro Logic-based project with only four channels (LRCS), I would advise you to mix it 5.1 (LCRLsRsLFE) and then mix the surrounds together and route to the mono surround channel. The reason for this is that most reverbs and panners are configured for 5.1 rather than LCRS. Use the LFE channel sparingly. Resist the temptation to use the LFE track: it is really only intended for special effects in films, like earthquakes! Most broadcast and music work is usually 5.0, with nothing going to the LFE channel. When mixing, always try to use a surround reverb plug-in. Digidesign's Revibe is an excellent surround reverb, and I reckon quite a lot of you will have it by now as a result of the plug-in offer Digidesign made with the v7 upgrade deal. Try it out and feel the sound envelop you just like it does in real life. Other surround reverbs include Waves' R360, which is also included in the 360 Bundle, while there are surround-capable convolution reverb plug-ins like TL Space from Trillium Labs and Altiverb from Audio Ease. 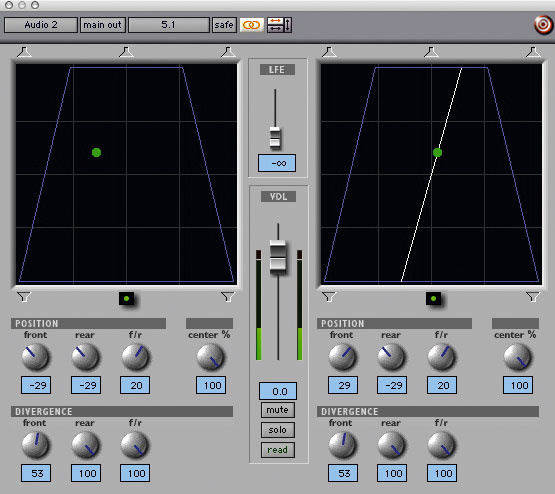 In stereo mixes you can use the pan control to position a sound within the stereo soundstage. Likewise, in surround you can pan a sound source anywhere in the surround soundfield, but doing so requires several controls to be adjusted simultaneously. Help is at hand, courtesy of the Digidesign Surround Panner, which allows you to route and position a stereo track in the surround soundstage. 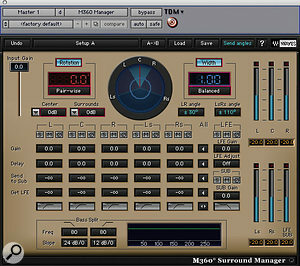 To use the Digidesign Surround Panner, click on the miniature fader button just above the meters of the appropriate track in the Mix window, and the Surround Panner window will open. From here you can position a sound source as you would with a conventional pan control. As you move the green dot around the box, you'll see all the channel pan controls moving in different ways, and it doesn't stop there. The Surround Panner has an extra set of controls at the bottom of the window called Divergence. Reducing the Divergence control will route some of that track into the adjacent speakers, so 'spreading' the sound. Another surround panner is S360 Panner from the Waves 360 Bundle. To use this, select it from an available insert on a channel. Waves offer a Width control rather than a Divergence control, which I find more intuitive to use. One of the limitations of Pro Tools LE systems is that you can only create mono or stereo tracks. You do not get the option to create tracks in multi-channel formats such as 5.1. All is not lost, though, and with a little 'out of the box' thinking you can produce surround mixes with a 002 or 002R system — the M Box only has two analogue outputs so you will have no way to monitor a surround mix from one! You will need a single control to change the volume of all six output channels. Using I/O Setup, assign outputs 1&2 to Front L&R, 3&4 to Centre and LFE and 5&6 to Surround L&R. 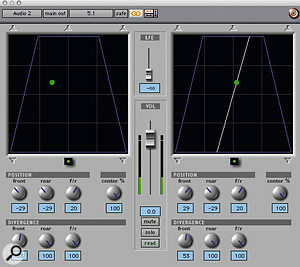 Then create master faders for these outputs and group them together and there you have it, a 5.1 monitor level control! LCR panning is tricky, but for music production in surround there is very little need for LCR panning. Route audio to the front stereo and surround stereo to taste, and use an aux send to route small amounts of things like kick, snare and bass to the centre channel. You can do the same for vocals if you prefer not to use the centre speaker, or you can do the opposite: send the vocals to the centre channel and add a little to the front stereo to help spread the sound, maybe with a little delay. With the limitations of LE, surround reverbs are not an option so you are going to have to use stereo reverbs creatively. Try a shortish reverb into the front channels and a longer reverb, preferably using the same algorithm, but with a larger space with less pre-delay, into the surround channels. 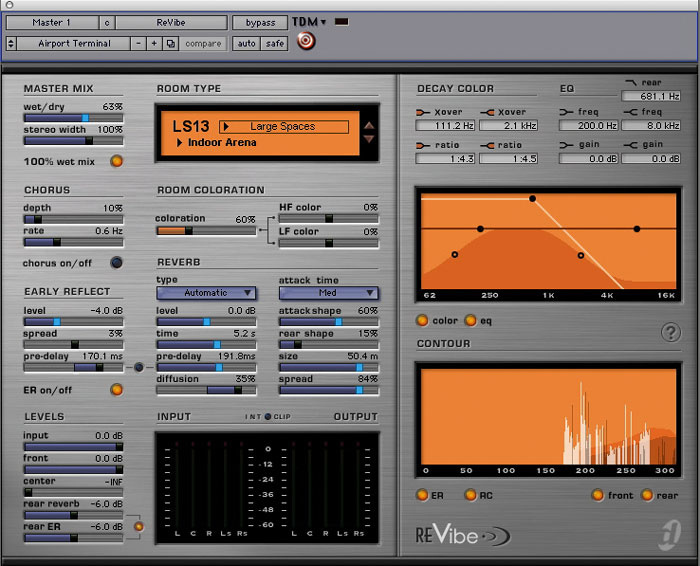 Upmixing is the name given to taking a stereo mix and creating a surround mix from it. Increasingly, clients are asking for their back catalogues to be remixed into surround for DVD release, so I thought it would be useful to include here some tips on how to do it and some pitfalls to avoid. Here is an example of how not to do it. It may seem sensible at first but I hope you will see the reasons why it does not work. For the front speakers, route the stereo input to the front left and right outputs. For the centre channel, mix the stereo input to mono and filter the low and very high frequencies to emphasise the dialogue or vocal and adjust the level to suit. For the surround channels take the stereo input, filter out the middle frequencies, add some delay with a bit of modulation and mix in at low level. Finally, for the LFE channel, mix the stereo input to mono, filter out everything above say 150Hz and route to the LFE channel output. So how should you do it? It's arguable that if all you have is a stereo mix you should leave it alone: any upmixing that is subsequently downmixed will give a degraded sound, because you can't predict what will happen to your mix once it has left your studio. However, if upmixing is what the client wants, there are a few tricks available to you. You can produce some very good and relatively downmix-safe results by using the Dolby Surround Tools or SRS Labs decoder plug-ins. Route the left and right inputs to the LtRt inputs of the decoder plug-in, take the LCRS outputs and route them to the appropriate channels. This will produce a reasonably mono- and stereo-compatible mix. You might want to add some stereo spread to the mono surround output to give some spread to the surround channel, but always check what it does to a downmixed version of your mix. One thing you will need to do is to compensate for the Dolby decoding process: this puts some delay in the surround output, so you will need to either slip the surround channel back or delay the other outputs. If you don't, when the listener hears it through their system there will be the additional delay to the delay added by their own system, and in a downmixed version of your mix we will get that flanging or phasing effect again. Use the 'Unwrap' algorithm in the TC Electronic M6000. This can work as well as or better than a Dolby decoder, but to get the best results from it you will need to adjust the settings individually for each scene or track. Use an M&E or backing mix. If you have access to the M&E mix (ie. the music and effects with no dialogue) or an instrumental backing mix for a music track, you can use either the TC Unwrap or Dolby decoder technique, using the full mix to derive your Centre channel and the M&E or instrumental mix to create your surround elements. Note that the two will need to be precisely in sync: audio derived from analogue sources such as tape will drift too much for this to work reliably. If you can get back to the original stereo session it is much better to start there, assuming you've got more than a few hours. You can make much better choices of how to route the various elements into the surround soundstage, and where available, you can use surround reverbs instead of stereo ones. For the final stage in the process, you will need to encode your mixes into some form of master file, the format of which will depend on the final delivery format. 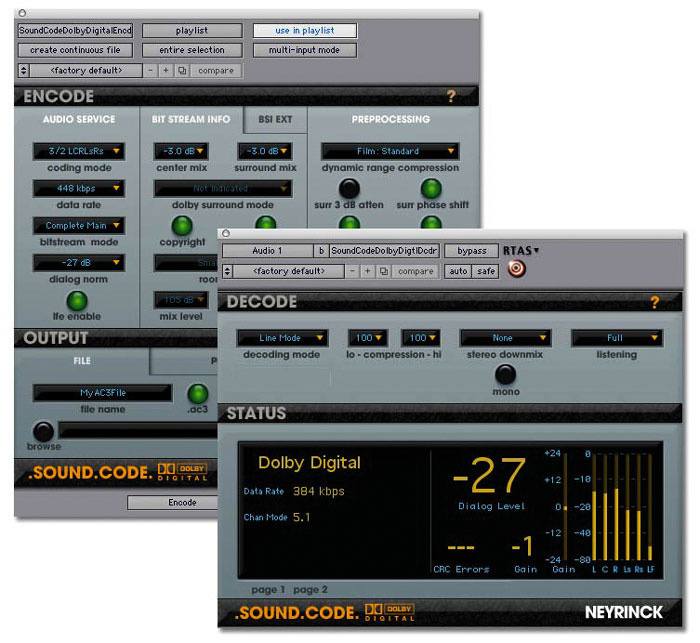 Neyrinck's Sound Code plug-ins allow you to encode Dolby AC3 audio from within Pro Tools. 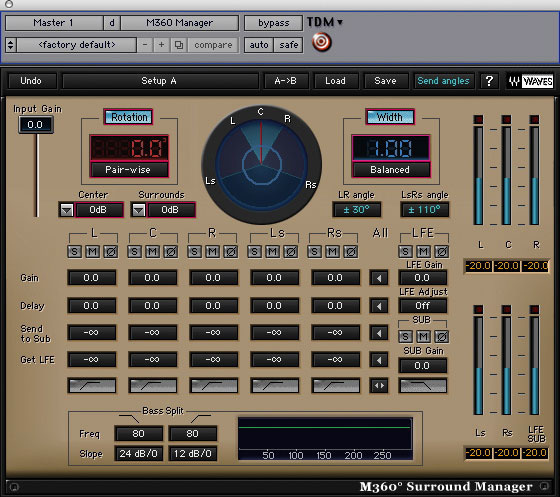 If you are restricted to a two-track delivery system such as an audio CD or normal broadcast channels, then you will have to save it in a matrixed encoded format such as Dolby Pro Logic, using Digidesign's Dolby Surround Tools plug-in or SRS Labs' Circle Surround plug-in; the latter outputs its own 'Circle Surround' format that also provides compatibility with Dolby Pro Logic II. You will need to be very careful to check both mono and stereo compatibility, as listeners without decoders will hear the encoded signal (usually called LtRt). Both decoder plug-ins provide you with the appropriate monitoring options to check this backward compatibility. You also need to be aware that the processed signal depends an accurate phase relationship being maintained. The mastering engineer needs to be aware of this, as some mastering processes can affect this, so make sure you check the mastered preview copy before you approve manufacture. This is one of the two encoding systems used for 5.1 mixes on DVDs. There are several ways to encode this format, but perhaps the easiest is the A.Pack software that comes with Apple's DVD Studio Pro, which enables you to take your mixed files and encode them as AC3 files ready for DVD authoring. More recently, Neyrinck have released Sound Code, an Audiosuite plug-in which will enable you to encode Dolby AC3 files without even leaving Pro Tools, and has a neat punch-in feature so that you don't need to re-encode the entire project just to change one little section. It also has a real-time decoder so you can check the entire encode­decode path within Pro Tools. This is the other encoding system used on DVDs. Minnetonka Audio Software make a range of stand-alone encoder software packages for both Mac and PC platforms called Surcode: you will need to bounce your mix in Pro Tools and then use these 'bounced' files as the source for this or A.Pack.